Harry A. Norton was the son of Arthur Osmore Norton, a successful inventor and industrialist in Coaticook, Quebec. He served as a trustee of the university from 1928 until his death in 1948. Harry Norton was a generous benefactor of the university and of Sherbrooke Hospital. His financial legacy made possible the construction of Norton Hall at Bishop’s as well as the Norton nurses residence at the Sherbrooke Hospital. The Music Building is in the centre of campus along the south-eastern side of the Bishop’s “Quad,” right beside the library. Only part of the Norton complex houses the Music Department’s faculty offices, classrooms and practice facilities; the remainder of the building serves as a student residence. This means you can actually live upstairs and come to classes downstairs! Named in honour of two generous friends of Bishop’s University, Mona Blair Bandeen, and former chancellor Robert A. Bandeen, Bandeen Hall is the centre piece of musical life on the campus of the University. A welcome complement to the excellent cultural facilities already provided by Centennial Theatre, the 156-seat Bandeen Hall combines modern technical services with the rich acoustics and the intimate grace of a nineteenth-century building. Built in 1897 as the University’s first gymnasium, the oldest part of the Norton complex has become the present day recital hall. Even before the addition of the two residence wings (1949), the hall had been called to numerous other vocations: a drill hall, a social centre, a dining hall, and, most recently, the studio for the Department of Fine Arts. The 1993 restoration, conceived by architect Paul-André Caouette, has carefully preserved the architectural integrity of the building, highlighting its most captivating features, while at the same time providing a functional home for music making and music learning. Public access to the facility is through the inviting lobby where the bluestone floor, the arched windows and elegant circular stairway announce the building’s original charms. The recital hall itself is dominated by a large bay window at centre stage and the vaulted ceiling, restored to assure superb acoustical response. Architecturally, Bandeen Hall echoes the historic St. Mark’s Chapel across the quad and serves to remind the listener of the University’s ecclesiastical past. All necessary amenities are close at hand: box office, vestiary, bar, washrooms, and artists’ facilities. The beauty of Bandeen Hall is more than skin deep. 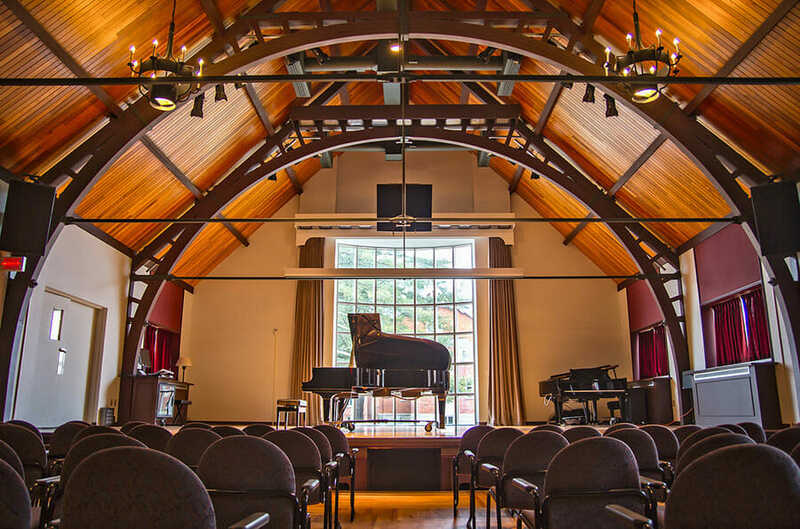 Designed to assure maximum comfort, efficiency and flexibility, the recital hall can be reconfigured for a variety of different uses, including recording sessions or rehearsals for large ensembles, classes or guest lectures. The hall has been retrofitted as an up-to-date “smart” room and is equipped for professional quality recording. Furthermore, the hall is air-conditioned to assure year-round comfort. Beyond the hall itself, the Norton complex provides two fully updated classrooms, three main floor teaching studios, a recording studio, band room, percussions studio and six large, sunlit practice rooms. Designed to meet the needs of the Department of Music at Bishop’s University, the facilities are ideal for other music-related uses, such as summer camps and conferences. With this flexibility, Bandeen Hall and the entire Norton complex fulfills the role as a cultural resource for the larger community. There was a lengthy prelude to the installation of a new mechanical action organ in St. Mark’s Chapel. The project began as a proposal to recondition the existing organ, which had been installed 100 years ago, rebuilt in 1940, and once again required extensive repair. In 1993, in conjunction with the University’s 150th anniversary, the Executive Committee of Bishop’s Corporation authorized the organ as part of the sesquicentennial campaign, and the Friends of St. Mark’s struck a committee to oversee the project. After soliciting proposals from several organ builders and contracting a report from Professor John Derksen, a Toronto consultant, the committee decided to pull out all the stops and commission a new, custom-built organ by Karl Wilhelm. This instrument would have a case specially designed to complement the interior of the chapel, a configuration that would deal with the position of the organ in a chamber to the side of the chapel. University organist Pamela Gill Eby proposed a set of stops appropriate for the Anglican liturgy while also suitable for the classic German and French organ literature. As we watched and listened to the new instrument being installed, it became increasingly evident that our decision was the right one. 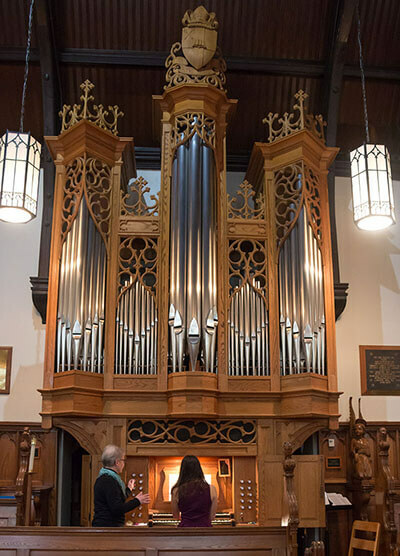 The new organ in St. Mark’s Chapel is one of the finest instruments in the Eastern Townships and will be a valuable cultural asset for generations to come. It has attracted many fine performers since its installation. Karl Wilhelm, the builder of the organ, was trained in Germany and Switzerland before he settled in Mont St-Hilaire. Out of his shop, established in 1966, have come hundreds of instruments for Canada, the United States, and around the world. Among these are the organs of Christ Church Cathedral and St. Mathias Church in Montreal and at St. Paul’s Cathedral in Burlington, Vt. as well as organs at Trinity College (Toronto), McGill University, Queen’s University, York University, Université Laval, the University of Ottawa, the University of Western Ontario and the University of British Columbia. Together with his team of accomplished organ builders, Karl Wilhelm Inc. has specialized in conceiving and building mechanical action organs in accordance with the principles of the classical tradition. The tonal finishing of the St. Mark’s organ was done by Denis Juget and Jacques L’Italien. Jacques also designed the pipe shades and the ornamentation; the carvings were done by Jean Dutin. Suspended key action and mechanical stop action. One manual coupler and two pedal couplers. All principal pipes are made of 70% polished tin; flute pipes have 28% tin and 72% lead. Open pipes are cone tuned; stopped pipes have a fixed cap. The natural keys are covered with bone, and the sharps are solid ebony. The pedal board is AGO standard concave with 30 notes. The organ case is made of solid white oak treated with a penetrating oil stain; it will darken gradually with age. The music collection is housed in the larger John Bassett Memorial Library located in the centre of campus, and consists of a wide variety of books, periodicals, scores and recordings. As part of the course MUS 300 (Research and Bibliography) music students take an active role in the surveying and maintaining of the collection. You may also view the useful links related to music on the Bishop’s Library Music Research Guide page.